The job market is absolutely brutal right now in many areas of the country — a fact that’s doubly true for recent graduates whose resumes are still a little light on actual job experience. This isn’t helped by the fact that many career sites like LinkedIn place a heavy emphasis on past jobs and workplace connections. Tonight, Brazen Careerist is launching a new professional social network for Generation Y that’s looking to solve this problem. Brazen Careerist launched over a year ago as a blog network, and has since grown to include over 1000 bloggers. Now, the site is also launching its own social network that’s centered around Generation Y — adults who were born from the late 70’s through the mid 90’s. Unlike LinkedIn, Brazen Careerist is trying to focus on the human side of these potential employees, offering an environment where users can share their thoughts and activities alongside their resumes. CEO Penelope Trunk says that neither LinkedIn nor Facebook are doing a particularly good job catering to Gen Y, at least in a professional network sense, and that while there are some other sites that have tried to tackle the problem, they’ve done so by trying to cater to employers first and using them to attract a community. In contrast, Trunk says that Brazen Careerist is focusing on building a community of young workers first, and that the employers will come to them. 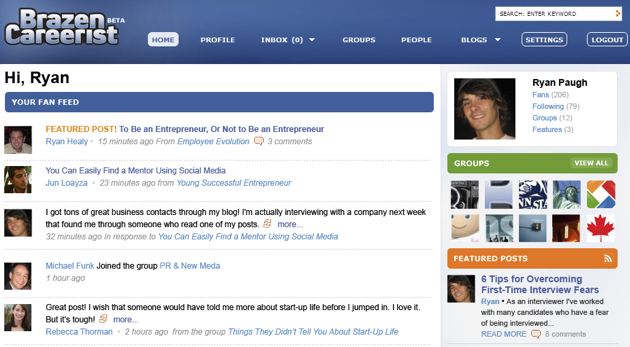 The site feels like a mix between Twitter, Facebook, and LinkedIn. When you log in, you’re shown your ‘Fan Feed’ — a list of updates from the members on the site that you follow (the site uses a one-way follow system similar to Twitter, so the people you are following aren’t necessarily following you back). Updates consist of status updates, as well as comments you’ve left on blogs in the Brazen Careerist network and any blogs you write yourself. Your profile, which is what potential employers are likely most interested in, consists of two parts: “Ideas” and “Resume”. The Ideas section is essentially a feed of all of your status updates, comments, and other actions on the site, which gives employers a three dimensional view of your potential and personality that they can’t get from a resume alone. For example, employers might check out some blog posts you’ve written to get a taste for your writing style and the way you think. Or they might check out the movie review you left for Inglourious Basterds, or the on-site Group you’re involved with that discusses marketing. The Resume section, as you might expect, includes a brief personal note along with your past career highlights. At this point, there are a few issues I see with the site. For one, users may have a hard time walking the line between writing updates that are personal enough to be humanizing to prospective employers, but not too unprofessional. I’m also concerned that these updates could devolve into endless streams of self promotion, which we’ve already gotten a taste of on Twitter. My other issue with the site is that HR reps don’t have particularly effective ways to browse through the applicant pool. At this point they can do basic keyword searches (e.g. “Marketing” or “Engineer”), and they can also look through the various job-oriented groups, but compared to the options seen on sites like LinkedIn, they’re pretty limited. Likewise, there doesn’t seem to be much in the way of recommending peers or establishing connections, which obviously play a key role in identifing promising candidates. That said, I think Trunk is right when she says that there is an under-served market for Generation Y job seekers. Brazen Careerist will likely need to continue evolving to find the right mix of professional and personal content, but it’s headed in the right direction.